Can you believe that September is already gone and October is here? Autumn is one of the most beautiful seasons of the year to visit Tuscany with coloring leaves, the wine harvest and traditional dishes with chestnuts and porcini mushrooms. Food Festival in Certaldo | Santa Reparata Celebration in Florence | Fiera of Scandicci near Florence | Steam train excursions in the Siena area | Chestnut Festival in Marradi. 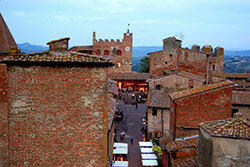 With the Food Festival Boccaccesca, the town of Certaldo returns to the era of 60’s and 70’s. An exciting journey that starts with food, the main ingredient of the event, with a pinch of art and artisan crafts. Both the lower part of the town as the medieval higher part of Certaldo (reachable by funicular) will host various events and activities. 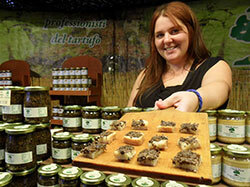 Such as a market with high-quality products and cooking shows by renowned chefs. A special area is reserved for street food from the twin towns of Certaldo, from Germany to Japan and from Senegal to towns in the Marches region. Great wines are provided by Enoteca Boccaccesca and Sommelier Zózimo. 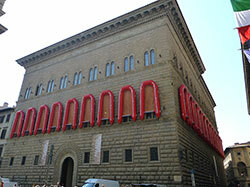 Santa Reparata is the co-patron saint of Florence together with St. John the Baptist. Legend has it that it was thanks to her miraculous intercession in 406 D.C. that the Florentines managed to fight off the Goths who had besieged the city. For this reason, the main basilica of Florence was dedicated to Santa Reparata, the Duomo was later build on the foundation of this ancient church. 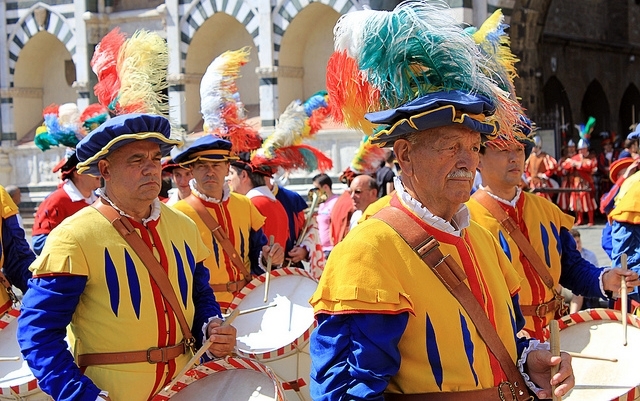 The city honors her patron saint with a historical parade that starts at 3.45 pm at Piazza della Parte Guelfa, to arrive at the Duomo around 4.30 pm where in the Santa Reparata Crypt under the cathedral offers of candles and garlands in honor of Santa Reparata will be given. Stretching out over more than 18.000 square meters, the Fiera di Scandicci is one of the largest market fairs in the region. This year the market that started out as a cattle market celebrates its 150th edition. The 350 stalls in the mostly covered expo areas have everything to offer what you would expect from a fair such as food, street food, wine, health and beauty products, artisan crafts, cars, decorations, home, fashion, and special areas for education and children. Scandicci is located just south of Florence and can be reached by tramvia from the station. Stop De Andrè or Resistenza. Tickets: Adults € 32.00, children up to 10 years: free without a right to a seat, if accompanied by at least one paying adult. € 16.00 with assigned seat. A unique way to discover the Siena area is by steam train. 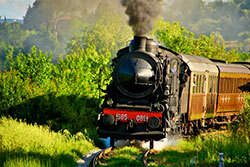 The “Nature Train” usually leaves from Siena and takes you on a ride through the beautiful Tuscan hills. The destination of the train depends on the excursion such as the Porcini mushroom fair, White Truffle Trade Show, Olive oil Fair, traditional markets or other typical local events. For more information and booking visit the event’s website (in English). Every year Marradi, a small town in the Mugello area north of Florence, holds one of the largest chestnut festivals in the region. 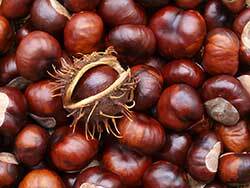 The town is proud of its high-quality Marradi chestnut and the many food stalls at the festival offer a broad range of traditional delicacies with the chestnut as the main ingredient. Tortelli with chestnut, castagnaccio (chestnut cake), roasted chestnuts, chestnut marmalade, candied chestnuts, chestnut pie and much more. 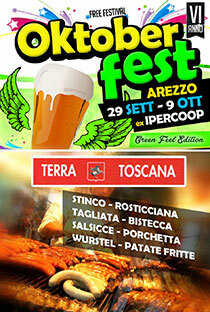 Besides the traditional Bavarian beers, the Arezzo Oktoberfest also offers a broad variety of artisan local brewed beer. The restaurant area, managed by several restaurants from the area, serves traditional dishes also from the grill and tasty desserts. Furthermore, you can take a stroll among the many stalls of the International Market and the Hobby Market, enjoy sport and games, listen to music or have fun at the Luna Park. Palazzo Blu in Pisa is ready for the opening of the exhibition Dali, the classical dream featuring over 150 works of Salvador Dalì including paintings, watercolors, and woodblocks. The show presents the Spanish master’s rich oeuvre, through a selection of major works that shows the extent to which Dali was inspired by the tradition of the great masters from the time of Raphael and Michelangelo. 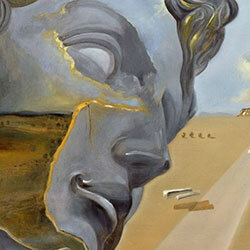 The works of art are on loan from the Museo Fundación Gala-Salvador Dalí di Figueres, the Dali Museum of St. Petersburg in Florida and the Vatican Museums. 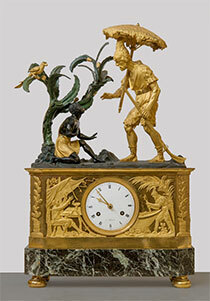 More information and skip the line ticket booking can be found on the website of the Dalì exhibition.